We have the supplies you need for successful gift-selling and marketing all year long! Largest selection of Cellophane bags anywhere! Check out our Combo Packs! 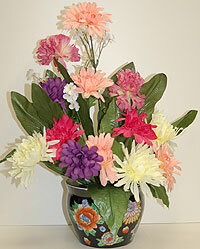 Floral Potted Arrangement in a 6 inch ceramic pot. Approx 18 inches tall. Your choice of Black or White Floral pot. Silk flower colors may slightly vary. These arrangements can add color and interest to your display tables. My Girlfriends House and MGH Wholesale Distributing, we cater to our valued customers, it is our top priority. We are distributors of wholesale cello bags, cellophane gift wrap, cellophane rolls, cellophane wrapping paper, cellophane shrink wrap, gift bags, gift packaging supplies and jewelry merchandise. We are excited to assist with any product or ideas you have or need help with in our store.